One thing I’ve learned in all my years of taco-ing is that making a good taco is not really as simple as throwing everything but your kitchen sink into a tortilla and calling it dinner. The best tacos have a mix of flavors and textures so that all your tastebuds are activated with every bite, creating a feeling of being totally satisfied as you’re chowing down. When I got it into my head that I wanted to make butternut squash tacos as a celebration of fall, I knew immediately that I had to add some texture into the mix so that it wouldn’t feel like I was eating bite after bite of mush. That’s where the relish comes in – a mix of cranberries, apples, jalapeños and ginger, it adds some much-needed sweet-tart-spicy pizzazz, as well as some serious crunch. Black beans are thrown in for protein, making these tacos a satisfying lunch or dinner. Both the roasted butternut squash and the relish can be made ahead, so with a little bit of planning, these tacos can really come together in almost no time. Taco night every night? I am SO in. Stuffed with roasted butternut squash, hearty black beans and a sweet-tart-spicy cranberry relish, these tacos couldn't be any more perfect for fall if they tried. In a large bowl, toss together the butternut squash, olive oil and salt. Spread on a parchment-lined baking sheet in an even layer and roast until tender, 20-30 minutes, tossing once halfway through. Meanwhile, prepare the Cranberry-Jalapeño Relish. 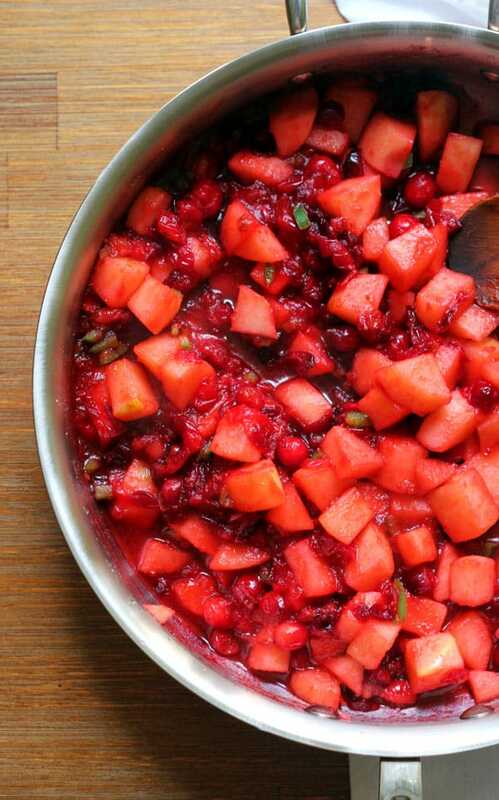 In a medium saucepan over medium heat, combine the cranberries, apples, sugar and apple cider vinegar. Cook, stirring frequently, until sugar has dissolved. Raise the heat to medium-high and cook, stirring constantly, until cranberries start to pop and mixture has thickened, 5-7 minutes. Stir in the jalapeño and ginger and remove from heat. Warm the corn tortillas according to package directions. 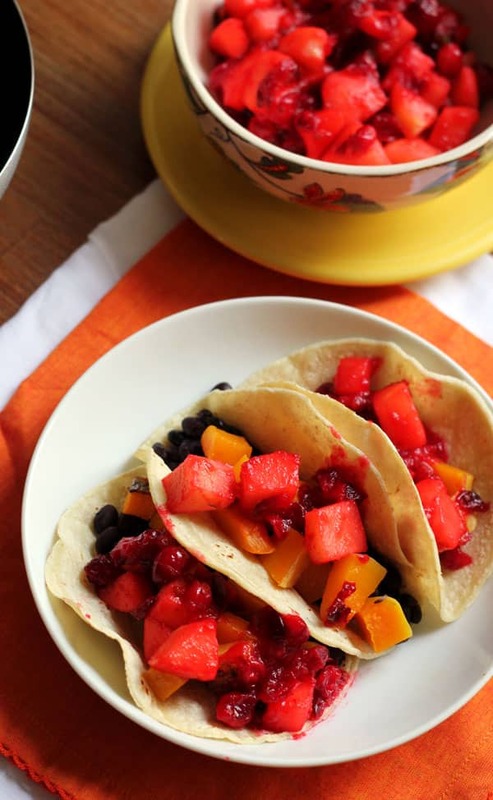 Serve the tortillas stuffed with the butternut squash and black beans, and topped with the Cranberry-Jalapeño Relish. Both the butternut squash and relish can be made ahead of time! Just reheat the butternut squash before stuffing it into the tortillas. This looks perfect for ramping up to the holiday season! Thanks! It definitely is a pretty festive dish. I never thought I’d say that a taco was festive, but these are!! Looks great! Haha that is EXACTLY the word I would use to describe them!